This month, Jelly Theory sat down with Erik Klein. Currently the CTO of SofaLabs, Erik was employee #13 at both PayPal and YouTube, hence Lucky 13. Erik, how did it all begin? I was a tech geek in high school. I went to the same high school as the co-founder and former CTO of PayPal, Max Levchin. He moved from Ukraine during our sophomore/junior year. We were in the same band and part of the same BBS communities. Back then, there was no concept of an Internet identity. How did you stumble upon PayPal? In 1999, it was the height of the boom before the first Internet bubble burst. Companies such as Webvan and Pets.com were getting huge. It was hard to find programmers. If you knew good programmers, you grabbed them. PayPal was becoming real. Max asked me to join the PayPal team. Rather than work a corporate job in Chicago, I flew out to Silicon Valley. In the beginning, I slept on Max’s floor as I worked 16 hours a day and searched for an apartment. What was your role at PayPal and later at YouTube? I worked at PayPal for 6.5 years. While I was there, I wrote customer service software and was responsible for the CS team, making sure sure that software development was going in the right direction. At YouTube, I wrote ad software and worked on Google AdSense integration. Having left PayPal for some time now, what's your view on the online payment space? How is it innovating, and who are new players to watch for? PayPal facilitates two kinds of commerce: merchant sales and person-to-person transactions. Buying from a merchant is less risky because the merchant is liable for payment. New platforms such as Facebook have potential to take up the peer-to-peer market. However, the biggest problem that most people don’t realize about online payments is massive fraud. Thirty percent of PayPal’s efforts involve fighting fraud. PayPal is no longer the small startup it used to be when you first joined. From your perspective, how has the company evolved? PayPal started out as a startup with core beliefs that were set up by its founders: hard work, rapid innovation, a high standard of security, and engineering-driven processes. PayPal was a tech company above a business-oriented company. Over the course of my six years there, I saw the company grow. The initial culture diluted, beliefs thinned out, and the company made compromises. There wasn’t anything right or wrong about PayPal’s evolution, but a natural course that many startups take as they make it and become larger. So, what brought you to YouTube? In December 2005, I took a month off from PayPal and realized I wanted to work at a smaller company again. I didn’t enjoy the slower pace of a large company in terms of moving a product forward. At a startup, you build features and make every decision along the way to push them out in good time. I joined YouTube because I knew the engineers from PayPal and enjoyed working with them - I liked the people. I was also excited about using Python as a language. What was it like at YouTube after Google acquired it? 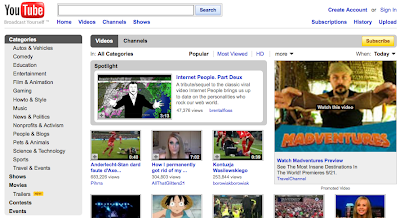 YouTube is the second largest search engine on the Internet, so Google owns the #1 and #2 engines. Using Google Search was a big win for us. After Google acquired us, Google was good about leaving us alone and allowing us to develop as a company as before. Google realized that we were a winner in the online video space and told us that its team wouldn’t come to us, but if we needed anything, to let them know. Unlike PayPal, YouTube was a company for only a year before it was bought out. PayPal was 4.5 years old and relatively mature. YouTube was small, and Google gave us freedom to do things the way small companies do. What is it about Silicon Valley that makes it so conducive to entrepreneurship? Do you think such an ecosystem can be replicated elsewhere? Going back, Silicon Valley started with the combination of Stanford, semiconductor companies, and older industrial technical companies such as IBM, National Semiconductor, HP, and Apple. These companies made up the first generation of the Valley, and its employees went about in buttoned-up shirts and Heroes glasses. Then came the next generation of hackers. Now we're in the platform generation. If you’re building a site now, it would be silly to build it yourself because there’s so much to leverage. In 1999, sites took a long time to build because it was all about PHP and Python; engineers built everything from scratch. Now you can make a site happen in weeks. This generation can be described as a Lego generation: you piece things together and fail fast. You don’t have to build a user base by yourself with features such as Facebook Connect. You've been in Silicon Valley for ten years now. Any lessons to share? Spend the majority of your efforts on the stuff you have to do and don't worry about your teammates’ work. At a startup, your team is your family: you talk over dinner and share opinions, but there has to be a baseline of trust. You need to worry about your stuff and get your stuff done. Respect your teammates and treat them fairly. Don’t let petty issues get in the way of your relationships. What has been a memorable moment of your career here? The PayPal IPO party: It was the only party I attended on Friday and was still sore on Monday. Many entrepreneurs work as life. Thoughts? When I was 24 and working long hours at PayPal, the head of DBA, Paul Tuckfield, was working long hours, but he also had a family and even managed to perform music every Friday. He was someone to look up to. I don’t believe in your work destroying personal life: you can work hard and have a personal life. It comes down to working smarter and understanding that if you put in a full day at work everyday, your work will get done. An entrepreneur is someone who feels responsibility for everything he/she works on. ...GREEN|FINGERPRINT. 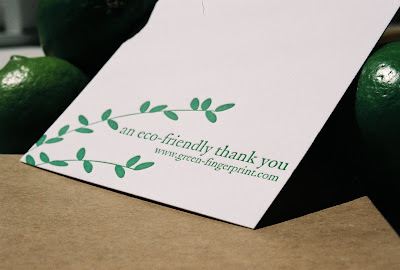 GREEN|FINGERPRINT is an eco-friendly stationery business started by two sisters Catherine Saunders and Jacqueline Richelieu two years ago. As a child, I fell in love with stationery and pens, so it was a personal pleasure meeting with Catherine over breakfast and finding out more about the idea and execution behind this young venture. Catherine, where did your love of stationery come from? Jacqueline and I grew up in Southern California. 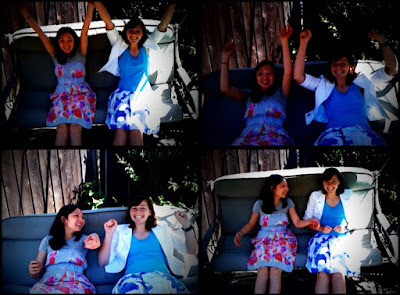 Only 16 months apart, we grew up as twin siblings and best friends. Our passion for stationery started when we were seven to nine years old: we set up a stationery stand on our front lawn. Using rubber stamps and other items around the house, we made thank you notes and greeting cards for our neighbors. Now at GREEN|FINGERPRINT, the two of us work on every facet - accounting, branding, design, printing, etc. And how about the eco-friendly part? How did you decide that your stationery business would be built around a principle of environmental sustainability? Two years ago, Jacqueline and I were eating lunch with our mom in Pasadena and decided we would create this company and write a business plan. We visited a stationery store and asked the clerk what percent of paper was 100 percent post-consumer recycled. He said none, and we saw a business and social opportunity in that. A lot of stationery businesses are going eco-friendly. 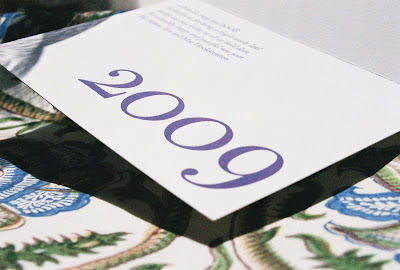 For example, Cranes's letterpress products are printed on tree-free cotton rag paper. But we're not just offering an eco-friendly option - we're based on a completely eco-friendly business model. Printing is inherently not an eco-friendly process, and we're thinking about ways to innovate in the eco-friendly stationery space. This means staying on top of new methods as they come out into the market. From our inception, we've been eco-friendly at our center. Our goal is to be totally carbon neutral at the end of this year. In printing, there's still water involved. Energy is used when we mail things, and we want to think about our entire carbon footprint as a business - so we're looking into purchasing carbon offsets, for example, planting trees. This would cut into our profit, but consumers wouldn't bear the burden of this cost. What products do you currently offer? 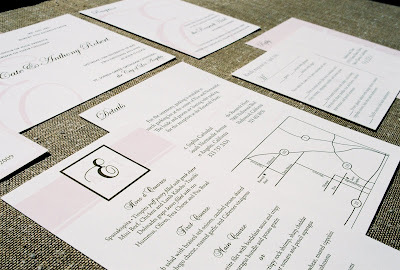 Wedding invitations, personal stationery, baby announcements, event invites, corporate identity jobs (from designing logos and letterheads to business cards), greeting cards, etc. 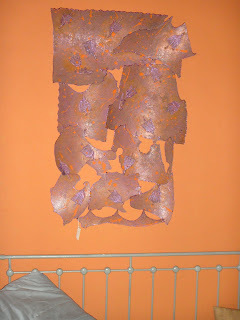 What's special about the paper you use? A tree-free cotton rag paper that is made from scraps of cotton that are a byproduct of the textile milling process: it's soft and well-suited for our letterpress products; 100 percent post-consumer recycled paper, which comes in two colors (white and off-white) and two weights (130 pound and 100 pound, which we use for digital printing). What were your first steps in launching this business? We wrote a business plan and got things off the ground as a limited liability company. Our initial investment included buying computers and software, and we went on a search for 100 percent post-consumer recycled paper. To start off, we designed eight thank you notes and printed 500 of each. We bought the Adobe Creative Suite. The school I taught at at the time had a multimedia classroom, and the graphic designer there helped me out with my initial designs. Last summer, I started learning the programs at a deeper level. With Jacqueline's photography skills and my art background, it wasn't about learning color or design, it was more the technology piece that was missing. We had also done a lot of design work for our own weddings and bridal showers. Right now we don't have a storefront, but have plans to have one in the future. What were you up to before GREEN|FINGERPRINT? I taught high school for six years in West Philadelphia and San Diego and then taught law in Fresno at a progressive charter high school. Jacqueline works in private wealth. What is competition like in the stationery business? Competition or coopetition? 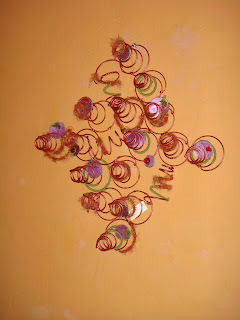 Within the stationery and creative arts community, there is such a sense of community. We try to offer a personal experience. When a client calls, s/he talks directly to us and can do pretty much whatever s/he wants in terms of customizing colors, fonts, etc. 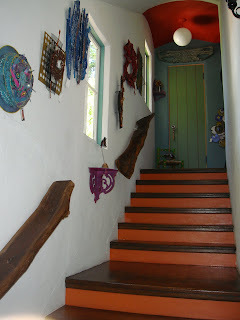 Each design house has its own identity, and our's is modern and sleek. We haven’t found another company that marries modern style with an eco-friendly mission. Many eco-friendly stationery products have a more organic, seed/flower look. Women in their twenties and thirties who are planning weddings and of course people who appreciate design and the look and feel of high quality eco-friendly stationery. We want to be the choice for brides, moms to be, friends purchasing stationery for friends. 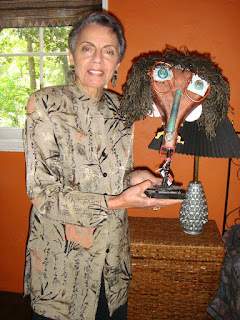 For example, a woman from Texas called about 300 plus invitations for a Bar Mitzvah. We're currently getting much of our business from New York, California, and Texas. 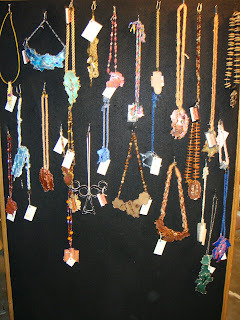 Are you open to wholesale down the line? We eventually want to get our stationery into the the stores of independent stationers and like-minded shop owners. We would begin with our thank you notes and get our binders of wedding invitations into stores. We'll also attend trade shows, where stationers large and small get their products out there. We're also thinking about stores like Papyrus and Paper Source. Crowdsourced companies such as Threadless have been a hit. Why haven't we seen similar successes in the stationery business? For stationers, design is a critical element. In large part, there may be some resistance to associating someone else's style of design with your brand. We don't want to be seen as a FedEx or Kinkos. Metrics. How do you track the social return on investment for your customers? There are various calculators out there to help us determine the trees, water, carbon emissions, etc. that we've saved in our processes. Part of our packaging tells consumers what they've saved in purchasing our products on personalized cards that we fill in (e.g., x gallons of water saved). We want them to know that our products don't come out of factories and that they've done something positive. What's your vision for GREEN|FINGERPRINT? We strive to produce and create stationery and invitations that are printed exclusively on tree-free and 100 percent post-consumer recycled paper and designed in modern and sophisticated styles. 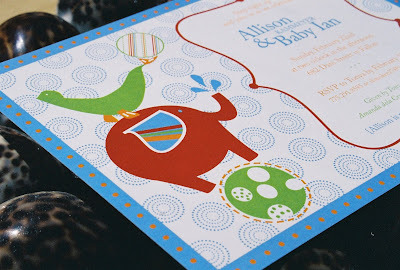 Our stationery is intended to excite you and even tug at your heart strings. In this digital age, there's still a need for written communication and for sitting down and writing a physical note to say thank you or assembling wedding invitations. A mentor of mine says that entrepreneurs must learn how to sell their dreams. Thoughts? When you're dreaming about a business, you're not dreaming about the challenges of distribution, production, accounting, etc. Who's providing us with paper and ink? What kind of ink do we want to use? What kind of company do we want to incorporate as? It's not so easy to translate a dream into a business and especially in design, a traditionally anti-business field. And finally, please define entrepreneur. An entrepreneur is someone who is passionate about what s/he wants to do, whether that's a product or service and is willing to make sacrifices to make it happen, which include emotional, financial, and physical sacrifices. The big payout is down the road, however you define big. As a women entrepreneur, there's the additional element of thinking about down the road. Do we want families? 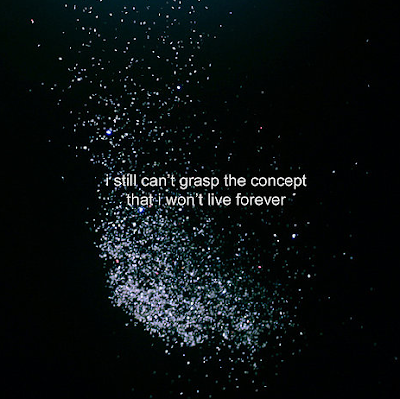 Can we have it all, our careers and our personal lives? I think we can. Thank you Catherine. 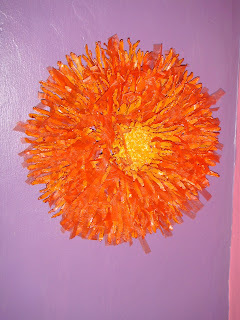 Jelly Theory is rooting for GREEN|FINGERPRINT and wishing you success in Martha Stewart's Dreamers Into Doers contest. You can fan GREEN|FINGERPRINT's Facebook Page and following them on Twitter. No, I didn't forget about the monthly interview series I promised you back in February. I hope you've enjoyed the first two so far as much as I've had great fun with them. This month did take a bit longer than before because I anxiously waited for a topic that fits in with all of the love (and pollen) in the air this new Spring season ... and I found one rather serendipitously. Social dating? How's that different from plain old dating? Before moving on, what would your guess be? Now, hold that thought. Eve, what does social dating even mean, and what's the idea behind your company MIXTT? MIXTT is a fresh spin on the old online dating model. Traditional one-on-one dating sites often produce pressure-filled and awkward situations - not exactly what people are looking for. If you look at the behavior of Generation Y, you see a lot of group hangouts happening instead of formal dates. MIXTT lets people set up small social gatherings with their friends and others - plans that may or may not have romantic undertones. For example, a guy and his friends can meet up with a girl and her friends. What and when was your "ah hah!" moment for MIXTT? For all of these reasons, I thought a group dating/hanging out scenario would be better. We began working on the site in November 2007, and it launched publicly in September 2008 at TechCrunch 50. Congratulations on making the cut for TechCrunch 50! I noticed that your website isn't explicitly positioned as a social dating site. Is this intentional? It is intentional with our current version. The problem is that there's no true name for what we're doing. We're promoting an activity that doesn't have its own online category yet. We don't want to say "dating" because there are high pressure and romantic expectations associated with that term, when what we’re trying to do is to help people meet casually and comfortably. In Version 2, we plan to use more explicit messaging through demos, videos, and commercials. The key message is that this is a fun, fresh way to meet people. What other improvements will you bring to Version 2? After launching the site, we realized that the notion of forming and operating specific groups doesn't do the best job of emulating social patterns in real life. People socialize in more dynamic ways: having a “posse” is very high school-ish; in reality, you have many different social circles. Version 2 will allow for more dynamic grouping so that an individual functions as a free agent. Version 2 may also leverage Facebook via Facebook Connect. What are your thoughts on revenue generation? In Version 1, we planned to use an ad-based model with affiliate programs and premium services. We’re still working out the details for Version 2, but I can say we’re most likely going to veer away from ads as a primary source of revenue generation. How do you view your predecessors in the social dating space? Social dating has been tried before. When you pitch the idea, people say it's great; but, it's all in the execution, and no one has been able to make it succeed yet. Successful sites all master some transaction: eBay mastered the auction; Amazon mastered online retail; Facebook mastered a few things, including sharing stories and even stalking. Sites that succeed are comfortable and intuitive to use, and are undergoing constant iteration. How do you ensure the safety of your users? On our site, users have the option to report inappropriate content, and our staff monitors profiles and can exercise the right to kick threatening people off. The great thing about group dating is that you're not alone, so there's an added benefit of safety. We also encourage users to meet in public spaces. People are getting increasingly savvy about their online-to-offline interactions, too. And finally, the last question I always ask my guest interviewees is: Define entrepreneur, please. An entrepreneur is somebody who takes a vision that s/he has created or a vision that s/he has developed by listening to other people, and executes on that vision with fierce determination and persistence. Thank you, Eve! Best of luck to you and your team. Today, I'll be in Calgary for the day. 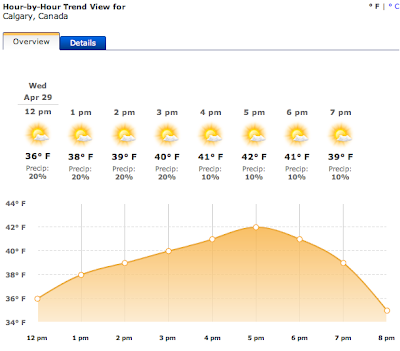 Weather by the hour, courtesy of The Weather Channel. As you scroll down, the temperature increases up to 25 degrees, seven clouds disappear, and the likelihood of rain drops to 0 percent. Am I missing out? Everyday we make choices that have associated opportunity costs: costs that can be measured (the cost of investing x dollars), and those that can't (in my case today, the cost of bad weather); the former being measured in units of money, the latter in mood. But I'm still going to Calgary aren't I, so what benefits are outweighing my disutility? There are many, but one that I'd like to share with you is: Reading in the sky! Trying to stay amazed. I was browsing in Sephora, and as I reached for a tube of lipgloss, I hesitated because, well, I remembered the Lipstick Index. It's an "economic indictor" that shows that in times of recession, lipstick sales increase: i.e., in bad times, women tend to treat themselves to smaller luxuries to brighten their spirits. This makes economic sense if you consider lipstick an inferior good (a good for which demand decreases when income rises and increases when income falls). I'm curious, do you buy this? During the Depression, lipstick sales increased by 25 percent. After 9/11, US lipstick sales increased by 11 percent. But, are the above events merely anecdotal? There seems to be no direct correlation in the graph (from The Economist) below. 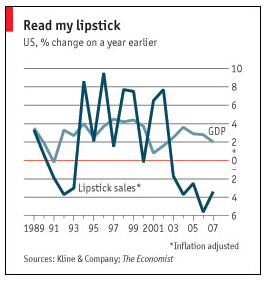 Notice that lipstick sales are also rising with GDP growth. 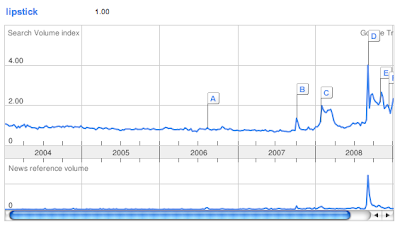 And, just for fun I'll throw in some Google, Facebook, and Twitter trends that I did - inspired by google.org's Flu Trends. 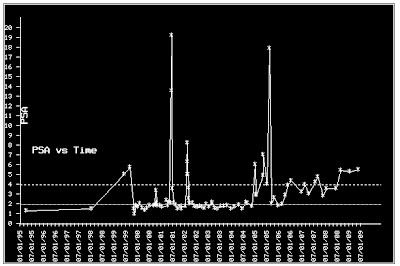 Be careful, those spikes you see in 2008 might have to do with Obama's "lipstick on a pig" comment in Virginia during election season. Not surprisingly, Twitterers are rather quiet on the topic. And for the record, I bought the lipgloss. Bird Abusing or Dad Amusing? Yesterday, Slate's "Today's Pictures" featured birds and their owners across different cultures and time periods. My two favorites are images 17 and 20, which I'm displaying below. 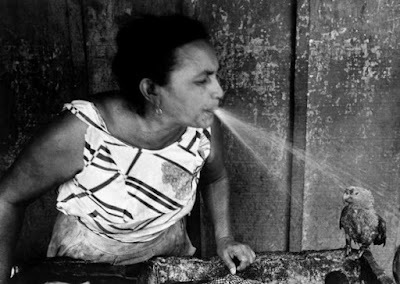 "MANAGUA, Nicaragua—A woman takes a break from hand-washing laundry in a sink to cool off her parrot on a blistering summer day, 1984." I've seen people water their plants like this before, but never bathe their pets in this way! Something to try on my future puppy? 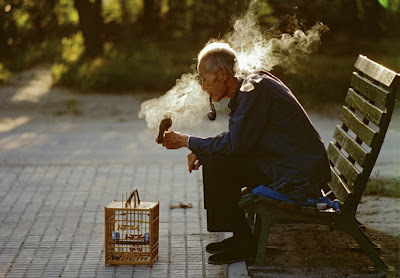 "BEIJING—A man with his pet bird in Ritan Park, 1984." The caption says 1984, but in Beijing today, you can still see old men walking their caged birds in parks. Sounds silly, but whenever I'm there, this is one of the sights I secretly look forward to because in this quickly modernizing, fast-paced city, it's rare to catch the calm of everyday life. It's so real. The smoking is typical, really. It makes me wonder now: How are pets in smoking households affected by second-hand smoke? FYI, the smoking population in China is greater than the entire US population. What is wrong with these birds? Bird number 17 is in shower while bird number 20 is in smoke. Looks like bird abusing! Um...or, dad amusing! When the first thing you do in the morning is laugh, it's going to be a fine day. 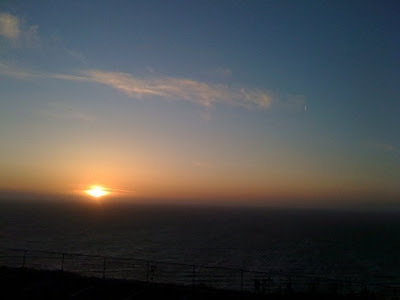 In Daly City, watching sunset on Good Friday. In Sunnyvale, eating gluten-free Easter brunch with the Browns. 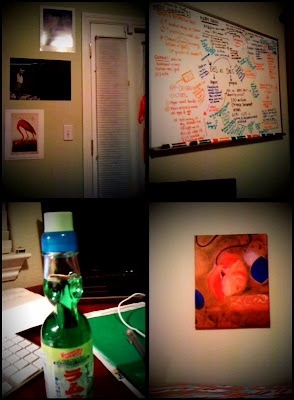 The multi-shot feature is courtesy of QuadCamera, an iPhone photography application that I recently discovered and am loving. 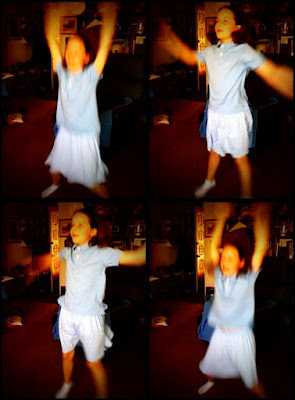 The app works best when you want to capture moving objects or different angles of still objects. See examples below. Best jumping jacks I've ever seen. Albert: have you noticed these fluttering by this week? migrate up around this time to northern california/oregon/washington? you've spotted one or spot one in the near future: note the location and time at which the Vanessa cardui graced your presence. you'd like to share a moment in which you were wowed or even repulsed by nature/the Outdoors. In each category, I'll randomly draw a winner who will receive a book of his/her choice that s/he has been meaning to read but hasn't because of the busyness that is life. Update on 4/12/09: Congratulations, Monica and Nick! Monica has chosen Mountains Beyond Mountains by Tracy Kidder, and Nick, Rapid Viz: A New Method for the Rapid Visualization of Ideas by Kurt Hanks. Enjoy, and watch out for future interactive posts that involve drawings! After graduating from Stanford with a degree in Symbolic Systems, Yul Kwon continued his studies at Yale Law and went on to work at law firms and other companies, including McKinsey and Google. In 2006, he was the winner of Survivor Cook Islands and went down in the show's history as one of the greatest strategists. Last year, he opened his first Red Mango frozen yogurt shop in downtown Palo Alto. In addition to Red Mango, he spends his time doing nonprofit/charity work and supports issues in the Asian American community, including bone marrow donations and political activism. Froyo is one of my all-time favorite snacks and one that I partake in with best friends and family, so it was a real treat speaking with Yul Kwon and learning more about the froyo market from him. I found him to be a very genuine and funny individual to talk to. And who would have thought that Yul Kwon is lactose intolerant?! After winning Survivor, why and how did you enter frozen yogurt industry? It was completely serendipitous. After Survivor, I stopped eating well. I wanted to find something healthy to eat because I gained 40 pounds. When I went to LA, someone introduced me to frozen yogurt, and it helped me get back into shape. I met Dan Kim, the CEO of Red Mango, through a mutual friend, and he asked me if I was willing to help him expand in the Bay Area. I had never owned a small business before, never done franchising. Having worked in the corporate world, I never had the desire to work in retail food, but I thought it'd be an interesting experience. I love the product and the guaranteed supply of yogurt! What is your specific role at Red Mango? I'm a franchisee, a small business owner, of Red Mango. I'm the public face in the Bay Area, the deal maker kind of. I spend a lot of time on overall strategy and organizational fit and building relationships with landlords, brokers, and Red Mango corporate. I spend some time in the stores, too. Is frozen yogurt a fad or here to stay? I believe it's a sustainable trend. First, if you look at the frozen desserts market, frozen yogurt occupies only a small share, so there's room for growth, especially if you look at other parts of the world where yogurt consumption is much higher. Second, the product is healthy, and there's been a long-term trend and desire for healthier products in all categories of food. Consumers are choosing food options based on health investments. Frozen yogurt is a low-calorie food with a lot of health benefits. Red Mango was the first frozen yogurt brand to be certified by the National Yogurt Association. Since Survivor, you've been getting a lot of media attention, including negative coverage on Red Mango being denied entry into San Francisco's North Beach community. How do you cooperate with the press and what did you walk away from North Beach with? Engage the press and get to know reporters too, so that they can understand your perspective. Be proactive and develop a relationship with the media. When North Beach happened, the press wasn't positive because Red Mango seemed to be bringing a large chain into a local community. San Francisco is a crazy place to open a business. There are lots of local politics, different political factions and local stakeholder groups. It's hard to navigate unless you're an insider. You need connections. For us, the problem was that there were written rules and unwritten rules. We didn't reach out to the right groups and politicians. We walked into a longstanding political issue (preserving the identity of the local North Beach community and preventing large chains from commercializing the neighborhood) that we weren't familiar with. That's an important and valuable goal. So you now have two locations, one on University Ave in Palo Alto, and another in Valley Fair mall in San Jose. How would you compare the two? Our Palo Alto store is an outdoor location, it's more of a neighborhood, whereas the one in Valley Fair is in a large mall, so there are different patterns in terms of the traffic you get and at what times. 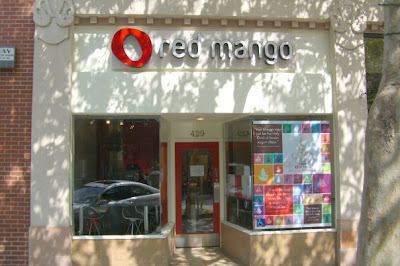 In Palo Alto, people go to Red Mango specifically because they want Red Mango. In a mall, it's a different proposition: people are shopping for other things and making spontaneous buying decisions along the way. 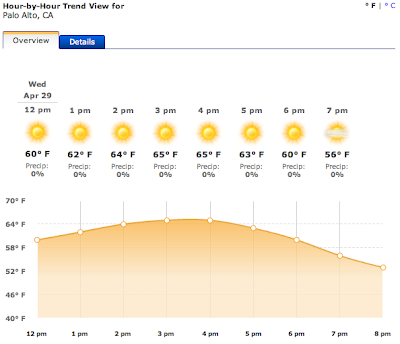 There's less seasonality in a mall location; in Palo Alto, we've become weathermen. What do you get at Red Mango? It changes, but I guess my favorite right now is pomegranate with blueberries, Ghirardelli dark chocolate, and mango. Who are your target customers at Red Mango? The majority of our customers are women, ages 18 to 44, interested in health. Young kids like sweeter things, but once they get used to it, they like it a lot. We're trying to get men right now. They follow the women. Haha. How do you stay competitive with popular brands in the area like Pinkberry and Fraiche? There are relatively low barriers to entry in the frozen yogurt space, thus the proliferation of different frozen yogurt brands. The process of education is important, as are other factors such as the product, ambiance, location, and brand. I picked which yogurt I wanted to be involved with based on taste and quality. It's tart, but not so tart that it's off-putting. I'm actually lactose intolerant, so there are very few dairy products that don't give me digestive problems, but for some reason I'm able to eat Red Mango. Fraiche recently opened a store on Stanford campus this year. Is this a missed opportunity for Red Mango? It's a missed opportunity because Stanford is my alma mater, and it would've been personally meaningful for me. I wasn't involved in the negotiation, but there was some misunderstanding/miscommunication. I was pretty bumped and upset, but it is what it is. What is your favorite non-Red Mango frozen dessert? Quickly. It's made with Dreyer's. The reason why you participated in Survivor was to break stereotypes of Asian men in the media. How do you continue to challenge stereotypes as a small business owner? Premium frozen yogurt is an Asian concept that's been able to cross over. In general, though, there's a perception of Asian products being shoddy/inferior. As a Korean American, I like the fact that Red Mango is a Korean product, but is seen and accepted by a broader community that includes many racial and generational lines. In an indirect way, the Red Mango brand serves the larger purpose of trying to demystify Asian images and products. Frozen yogurt can get pricey. How do you set prices? The franchiser makes recommendations, but the franchisee determines prices. It's a difficult issue because on the one hand you don't want to price too high, and on the other you don't want to feel your margins, so it's a complex problem you have to solve. It's a combination of margin-based pricing, how price sensitive your customers are, your competition, and what kind of image/brand you're trying to cultivate. Even now we debate our prices. Red Mango is a premium frozen yogurt brand. How is the economy impacting your sales? The whole recession threw a big curve into everyone's business model. Every food retailer has been hit by the recession and is hurting, there's no question about it. 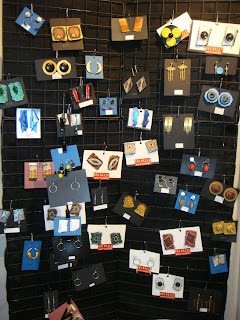 We haven't lowered our prices, but are monitoring and discussing prices depending on how things change. Before, with so many frozen yogurt operators trying to open stores, our strategy was to compete and win market share. Now, our focus is on lean operations. Share a memorable customer interaction, please. You know, I've had all kinds of interactions. A lot of times, fans of Survivor get excited when they see me. I remember this one time I was working behind the counter and shook a customer's hand. Later, I read on a Yelp review that I had a "meek" handshake. Someone who doesn't know better, a risk taker who wants to take a big gamble in terms of trying something new and controlling one's direction and destiny. Can you get more flavors of the mochi topping at Red Mango like grape, strawberry, green tea? Will there be a Red Mango in San Francisco soon? Part 3: Follow Your Passion? This post is the final part of a three-part series on Tina Seelig's talk, "What I Wish I Knew When I was 20," at the Women Making It Work conference. When people tell you to "follow your passion," they are either 1) simplifying the problem (the problem being, What should I be when I grow up? ), or 2) assuming that your passion inevitably aligns with your talents and market demand. Passion alone, region α, puts you in the fan/enthusiast category. 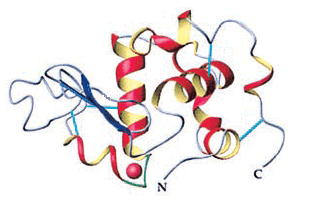 Passion and what you're good at , β, lead to a hobby. 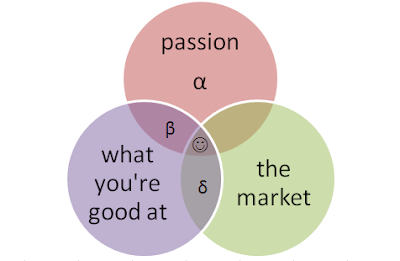 The intersection of what you're good at and the market, δ, is your job (as most will tell you). Where all three meet, that's the sweet spot. Find it, and be there. This post is part of a three-part series on Tina Seelig's talk, "What I Wish I Knew When I was 20," at the Women Making It Work conference last week. Tina Seelig walks into a supermarket. As she browses, a gentleman comes up to her with instant lemonade in hand and asks her how to make it. Seelig goes over the instructions with him, and as they talk, she finds out that he's visiting the Bay Area from Chile for a start-up related event. She gives him her card and offers to connect him with helpful individuals in her network...A few years later, Seelig travels to Chile for work and sends this man an email to see how he's doing. The man responds and asks that she meet him at the lobby of some building and bring her colleagues and friends along, too. When they arrive, they are met with a helicopter that takes them on a breathtaking ride over the country. Seelig's message here isn't about making lemonade, duh, it's about making your own luck by, in this case, engaging with seemingly strange people (a man with lemonade powder) in unlikely environments (the grocery store). The key word here is seemingly. "Lemonade networking," as I'll call it, is about building relationships, not networks; giving to give, not to get...and the surprise is waiting for you in the end. Tina Seelig, Executive Director of the Stanford Technology Ventures Program, is coming out with a new book. 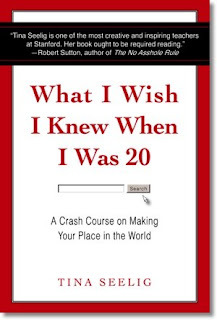 What I Wish I Knew When I Was 20 will be released on April 14, 2009. 2. Turn lemonade into a helicopter ride. 3. "Follow your passion" is cop-out advice. Each team receives an envelope with five dollars. In two hours, what's the greatest return you can make? Each team delivers a three-minute presentation on results to the rest of the class. The average amount of money made turned out to be around $200. Teams set up bike tire pumping services, even scalped restaurant reservations! However, the team that saw the greatest return ($650) did not use the $5. The students in this team realized that the $5 they were given had framed the problem when in reality they were given a much more valuable asset: the three-minute presentation. They sold those three minutes to a company that wanted to recruit students in the class. $216.67 per minute...not bad. The point is, think about all the assets you own. 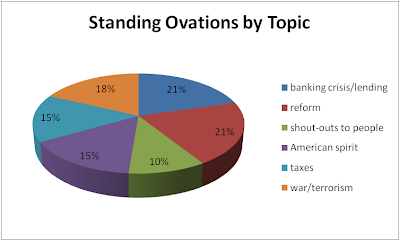 Obama's statements on recovery from the banking crisis (through renewed lending) and reform (energy, health care, education) won the greatest percentage of standing ovations, but even so, when you have a relatively even distribution of consensus from an audience, what does a speaker leave the stage with? The audience has a message, too. 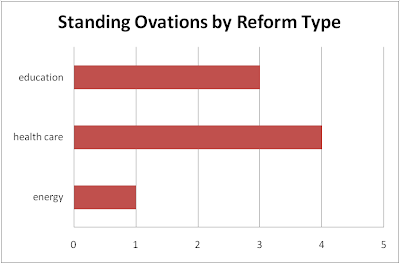 When you break down the reform slice of the pie, the results are a tad bit more compelling. Health care and education reforms lead those of energy/climate change. From a more personal point of view, I've always been one to find standing ovations awkward. If you think about it, it only takes maybe 15 to 20 percent of a large audience to find something standing-ovation worthy, and then that does it, the remaining majority is forced to follow. The next time you feel pressured to do so, just remember: being stingy with your standing ovations is not a bad way to go. Intellectual Property (IP) theft: People think that their ideas will be stolen/subverted (and sometimes they are! ), but it's important to treat competitors with respect. Trust, but verify. Quickly resolving problems in the design of your idea depends on understanding your environment and resources. 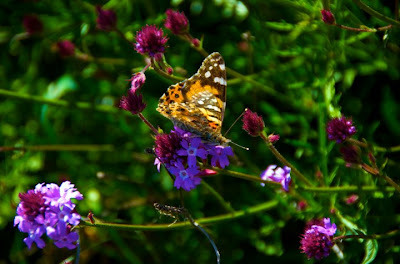 A sustainable idea adds economic value and/or enhances the quality of life. Think of a sustainable world as a space of innovation, as opposed to a place where you cannot do certain things. With Stanford EWeek 2009 about to end, that means it's been over a year since we (my close friends, classmates, and I) started a project called CAIR. CAIR didn't make it past the entrepreneur's gap, but it was my first theoretical exercise in entrepreneurship. Something cool happened, and the likelihood of it happening was close to zero percent. On Thursday I attended a Facebook Developer Garage in Palo Alto, which is an event that Facebook puts on to bring its application developer community together. The subject of this particular dev garage was Feeds and Social Distribution, and members of the Facebook Platform team gave developers a sneak preview of where Facebook is headed with the News Feed, and advice on how to create more user-engaging Feed stories. I blogged on the event for Inside Facebook - You can read it here. Being a Facebook-sponsored event, there was of course a Facebook Event created for the dev garage. I RSVPed "Attending" about a week before the event. A day later, I received a Facebook message from Mike, who was a complete stranger to me at the time. He wrote: "hi, mind if i ask u a question? have you been to one of these events before? just wondering what it's like and if i should make the trip from SF to go! :)"
I wrote back: "This is my first garage too, so I can't say. Sorry I can't be more helpful!" Improbable, huh? Thanks Mike for being my buddy during the event; for explaining some of the more technical concepts to me; and for giving me iPhone tips for beginners. Consider OpenTable (where Mike works) before making your next online restaurant reservation!